Is there such a thing as a perfect penalty? Probably not, but how can players give themselves the best chance of success? Great penalties are not just “luck”, it’s all about performing under pressure. So what strategies can players involved in penalty shoot outs employ to give them the edge over their opponents? 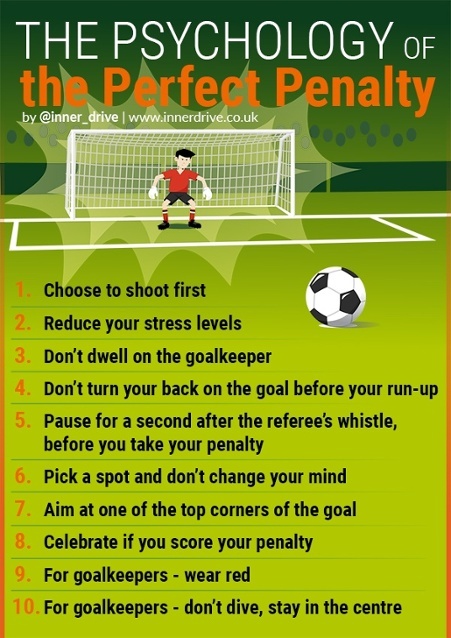 What does the scientific research from sport psychology actually say about how to take the perfect penalty? Since 1982, there have been 26 penalty shootouts at the World Cup Finals, but before a penalty is even kicked, you can increase your chances of winning a shoot-out. Researchers analysed 1,343 penalty kicks from 129 penalty shoot-outs and found that the team that started first won 60.5% of them. So basically, if you win the coin toss and choose to shoot first you have a great chance of coming out on top. This can be explained by pressure. Increased pressure is the single most significant cause of penalty failure. In the World Cup, penalties are only introduced in the knockouts stages. It’s not just a match defining moment, it’s the World Cup dreams of a nation at stake. So when players know they can take a penalty to win the shootout, the success rate rises dramatically to 92%. Whereas if a player knows that if they miss, they lose the shootout, success rates plummet to below 60%. Clearly, those who have learnt to handle their nerves at the World Cup have an advantage. Germany provide us with a great example of that, with the nation winning 5 out of 5 in their World Cup penalty shootouts. So how do sport psychologists explain this success? They’ve found that there are two key tricks that players may have used over the years and it relates to the relationship between them and the goalkeeper. The first trick is to realise that after you have placed the ball down on the spot it is a mistake to turn your back on the goalkeeper before the start of your run up. Researchershave found that those who do are more likely to miss. This is because it interrupts their preparation, allows them to focus on things they cannot control, projects their nerves and provides the goalkeeper with subtle cues as to where the penalty is going. The second trick is not to spend too long looking at the goalkeeper before the kick. In a study of 167 penalties, researchers found that those who fixated on the goalkeeper were more anxious and missed more penalties. It is far better to focus on your target and your abilities, or something that calms you down, rather than the opposition goalkeeper. Don’t rush your penalties. Take time to ready yourself. Research has shown that players who rush their penalties (i.e. respond to the whistle within 200 milliseconds) only score around 57% of the time. However, players who take time to ready themselves, be it only for one second, score on average over 80% of the time. We all know England struggle in World Cup penalty shootouts. Losing a record 3 times out of 3. It has left us with a 0 % win record at the competitions finals. Worryingly, England’s players have been seen to take their penalties quicker than any other nation. England football legend Steven Gerrard stated in his autobiography ‘Why do I have to wait for the bloody whistle? Those extra couple of seconds seemed like an eternity and they definitely put me off’. If only he knew that taking his time could have calmed his nerves and increased his chances of scoring. England aren’t alone in this perilously poor penalty pickle. Italy have also lost all 3 of their shootouts at the World Cup finals. Surprisingly, one of the most successful World Cup teams Spain, only have a 33% penalty shootout success rate. That’s lower than Brazil (75%), Argentina (80%), France (50%) and Germany (100%). Research has shown that by changing your mind at the last minute, players experience increased stress and uncertainty which leads to poor technique and inevitably a penalty miss. It is far better to pick a spot and commit to it. Penalties that are in the bottom/top corners are rarely saved due to the difficulty for keepers to reach them. So once we prepared well and then executed the skill of the penalty, is there anything else we can do? Well, according to research there is. One hundred and fifty-one penalties from the World Cup were analysed and researchers found that if a player celebrated their successful penalty, their opponent was far more likely to miss their next penalty. Watch how every penalty taker for Italy celebrated their goal during their penalty shoot-out win against France in the 2006 World Cup. What Can Goalkeepers Do In A Shootout? A goalkeeper’s kit can have a direct impact on the penalty outcome. The fewest goals were scored against goalkeepers who wore red (54%) or yellow (69%). The two worst colours? They were Blue (72%) and green (75%). Interestingly, it would seem that out of the major nations competing at this year’s World Cup, England (Yellow) and France (Yellow) will be the only team’s utilising this colour in their goalkeeper kit. Beside their kit colour, what is the best strategy for a goalkeeper to employ in order to save a World Cup penalty? Research suggests it is for them to stand still. Analysis of 999 penalties from the Bundesliga found that 15% of players shoot down the middle. A separate study of 286 penalty kicks from the top leagues around the world found that only 2% of goalkeepers remain in the centre. It is calculated that goalkeepers are actually twice as likely to save a penalty if they stay in the middle of the goal rather than dive. So why do goalkeepers rarely stand their ground? Psychologists refer to this behaviour as an “action bias”, which is where the value of being seen to do something is higher than that of doing nothing. If they dive and the opponent scores, the goalkeeper doesn’t attract blame, but if they stand still and the opponent scores then they do get blamed. It seems this fear of blame sub consciously overrules a perfectly good strategy. To find out more about Sports Psychology for Football, visit our guide page. 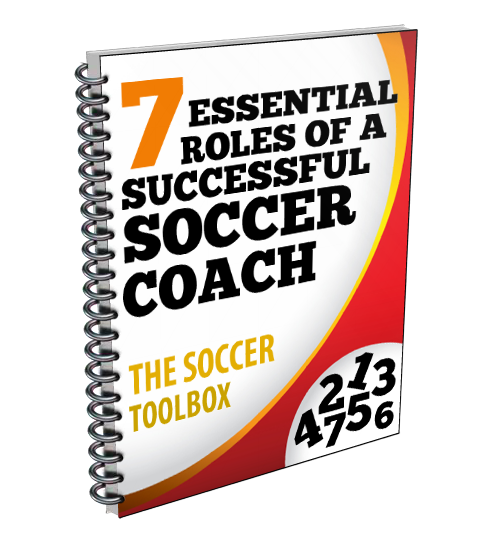 Enter your email address and click "Get Access Now"
to Our 7 Essential Roles of a Coach! A short report that defines the 7 key areas that every coach needs to master to run a successful program!